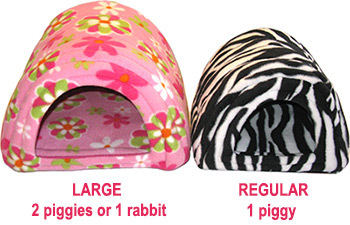 This listing is for our clearanced LARGE SIZE Hidey Huts! This roomy retreat is perfect for 2 guinea pigs or 1 small rabbit. Our removable potty pad is included to help keep your Hidey Hut clean. Simply toss in the washer when needed. This piggy favorite is well tested and piggy approved. LARGE: 12" x 12" x 10"